A great review for The Last Blade and a special bonus! | Beau's Books and Blog. Various tomes of hilarity and excitement. Welcome! « Two very nice reviews for The Unlikely Hero. A great review for The Last Blade and a special bonus! 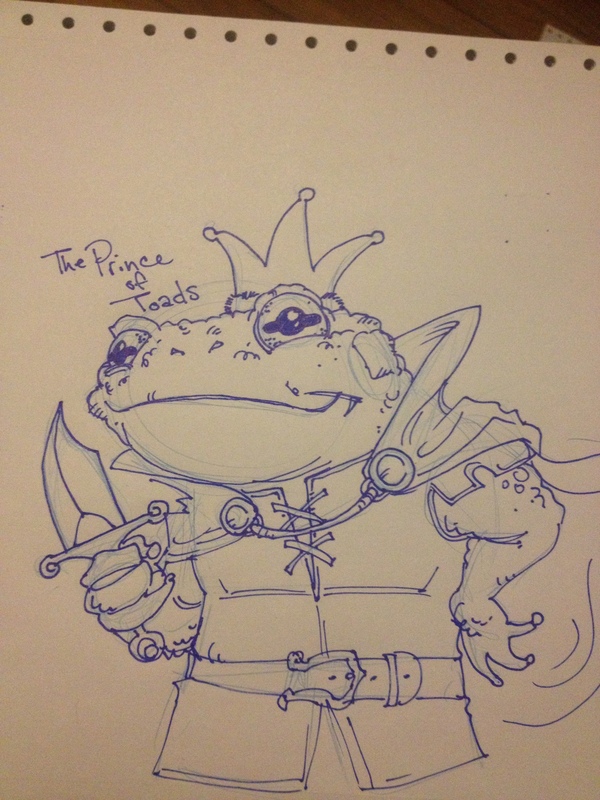 And just so this isn’t just a big plug for the book *wink, wink, nudge, nudge* Here’s a quick sketch of The Prince of Toads with his enchanted dagger. Thanks all! This entry was posted on June 10, 2013 at 1:38 am and is filed under Art Stuff., Author Announcements and Appearances., Reviews From Others. with tags action, adventure, assassin, comedy, dragon, elf, faerie, fantasy, gryphon, hero, hobbit, humor, LGBTQ, mage, ogre, parody, pumpkin, satire, sorcery, steampunk, sword, video game, warrior, wizard, young adult, zombie. You can follow any responses to this entry through the RSS 2.0 feed. You can leave a response, or trackback from your own site. Hi Beau, just to say, it was great to meet you at UK Meet in Manchester. I hope you enjoyed your day in London. I’ve been perusing The Blackside Bulletin today. Hope to see you at next year’s UK Meet, and before then on the internet. It was great meeting you as well. We had a fantastic time all around and couldn’t have felt more welcome. If finances allow, you will see me at next year’s meet. Keep in touch.